Why not call him ‘Mr Smith’? Anyone can be a journalist these days, as Melbourne University is proving with a new and free online course that aims to teach would-be reporters how to go about the job of keeping the public informed. Of course, modern journalism, as defined by our tertiary institutions, requires the correct perspectives and passions, which is why one of the course’s videos (viewable via this link) is something of an education in itself. A mock press conference, it presents a sleazoid property developer detailing his plan to drain a marsh and build 89 new homes. But they are not the only lessons Melbourne University’s Dr Margaret Simons and Dr Denis Muller would appear to be imparting. Do notice the name of the developer in the picture atop this item, a screen grab taken from the instructional video. 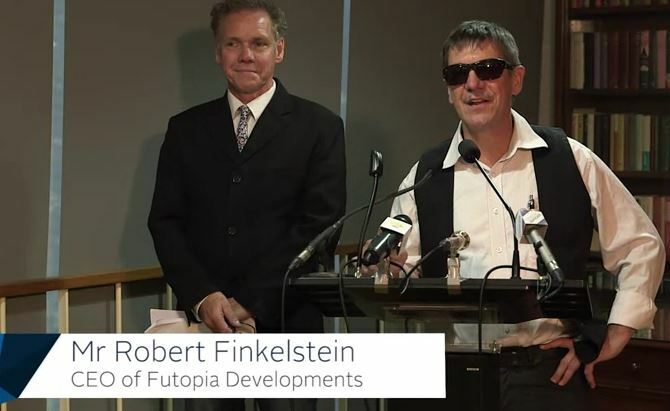 To which ethno-religious group do you reckon the fictional “Mr Robert Finkelstein” might belong? Why that particular surname? A note seeking explanation for the choice of name has been sent to Drs Simons and Muller. While we await their reply, why not get an education in modern journalism by signing up for the course via the link below.